Locate the phone number for your health insurance as well as your member ID number. You can find this information on your insurance card. 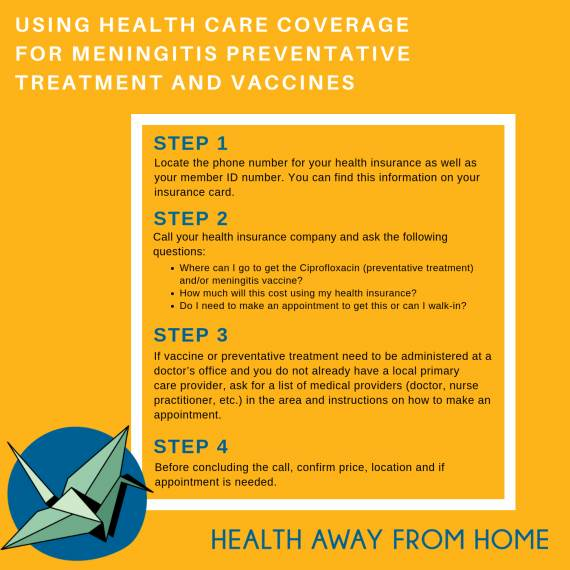 If you have Tricare insurance coverage please click here for more information (including information on the meningitis vaccine). Where can I go to get the __________ vaccine? How much will this vaccine cost using my health insurance? Do I need to make an appointment to get this vaccine or can I walk-in? If vaccine needs to be done at a provider's office and you do not already have a local primary care physician, ask for a list of doctors in the area and instructions on how to make an appointment. Before concluding the call, confirm price, location and if an appointment is needed. If you are a student currently enrolled at SDSU, a variety of vaccinations are available to you at Student Health Services. You can pay out-of-pocket for these vaccinations and if approved by your off-campus health care coverage, you may be reimbursed for the total or partial cost of the vaccine. To understand if your health care coverage will reimburse your cost, please call the number as described above and specifically ask if the cost of obtaining the vaccine at Student Health Services is eligible for reimbursement. Be sure to ask what the steps are to obtain this reimbursement. Q: Does SDSU require students to have health insurance? A: The California State University (CSU) does not require students to have healthcare insurance. However, the new laws implemented in 2014 by the Affordable Care Act require all U.S. citizens and legal residents to have healthcare insurance. Students enrolled as international students or through the American Language Institute (ALI) are required to have health insurance offered and approved through their respective programs. Q: Why do I have to pay a student health fee if I already have insurance? A: The health fee allows you access to Student Health Services (SHS), a healthcare facility that can address basic health care needs right here on campus in Calpulli Center. SHS offers quality and convenient healthcare by certified healthcare professionals. The health fee also supports Counseling & Psychological Services and Student Disability Services. Q: Where does my health fee go? A: The mandatory Student Health Services fee includes the cost of staffing, supplies, services and administrative and accounting costs incurred by all 4 departments at Calpulli Center. Also see, What Do You Get With Your Tuition? Health and Wellness Resources at State. Q: Why do I need insurance if I have access to Student Health Services? A: In 2010, the Affordable Care Act (ACA) was signed into law. The law requires that U.S. citizens and legal residents have health insurance. Having access to Student Health Services is not the same as having health insurance. If you would like more information regarding the ACA and how it affects you, or you would like to know how to obtain healthcare insurance, schedule an appointment with the Health Promotion Department Community Resource Specialist. Q: Is Student Health Services (SHS) considered health insurance? A: SHS is a great resource for basic health care, however is not considered a health insurance plan under the new Affordable Care Act laws. Q: Does SDSU offer/recommend health insurance plans? A: The California State University (CSU) offers several health plans depending on which campus you attend. If you are interested in the plans offered by the CSU, review your school’s plan. To discuss additional options (e.g., Covered California) that are available and/or that you may qualify for, schedule an appointment with the Health Promotion Department Community Resource Specialist. Q: How can I sign up for Covered California? SDSU students can schedule an on-campus appointment with San Diegans for Healthcare Coverage (SDHCC), (619) 231-0333. Visit the American College Health Association Health Insurance page and Affordable Care Act page for resources on these topics. Resources include programs, publications, guidelines, and more.